Oscar Lopez Rivera in President Obama’s House! Wow! 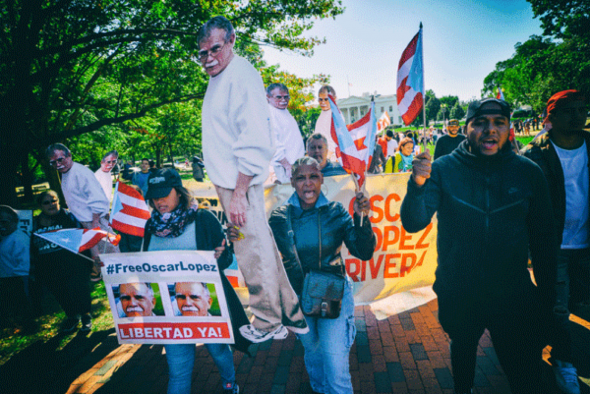 October 9 in Washington, DC in front of the White House–a freedom clamor from a multitude for Oscar López Rivera’s unconditional release made an infinite mark in history. It is an event where “Oscar estuvo en la casa de Obama“. If we were to measure the energy level of the people that attended the event, it was over 2,000 volts. Everyone’s faces were radiant. There were many speakers from all walks of life and representing all political ideologies, a norm for Oscar who has become the moral power to unify forces. The event was organized by a coalition in Puerto Rico and the mobilization came from the diaspora. There were ecumenical figures that did the convocation. Congressman Luis Gutiérrez, NY State representative Adriano Espalliat, Speaker of NYC Council Melissa Mark Viverito, candidate for governor in Puerto Rico, María de Lourdes Santiago, San Juan Mayor, Carmen Yulín Cruz, Cornel West sent a recorded message, Rene Perez (El Residente de Calle 13) and then the cultural presentation. Danny Rivera, Roy Brown and Tito Auger and others provided the cultural event where some did interpretations of Juan Antonio Corretjer’s songs. Danny Rivera when he sang “Tu pueblo es mi pueblo” resonated with the public. A high point of the rally was Oscar’s family coming onto the stage. Mercedes (Oscar’s oldest sister) and Zenaida (sister), Babbi (niece), Lourdes (niece) and Clarisa (Oscar’s only daughter), could not wipe the grins off their faces as they watched thousands rally in solidarity to the Lafayette Park, in front of the White House were the rally took place. 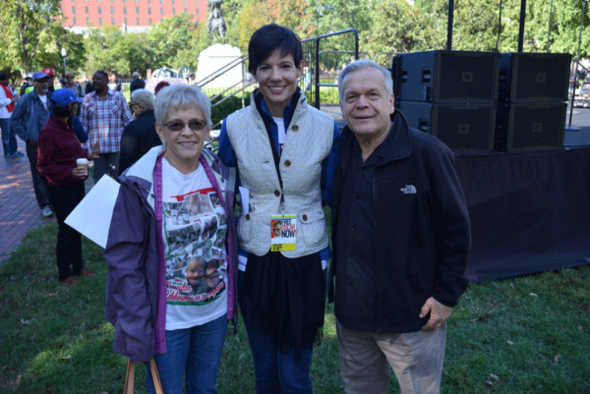 We were also in the presence of former Puerto Rican political prisoners like Luis Rosa, Ricardo Jimenez, Edwin Cortes (given presidential clemency by Pres. Bill Clinton) and Felix Rosa all that have been relentless in the campaign to Free Oscar. People from all walks of life came from more than 30 cities from north to south of the East Coast to the Midwest and California. Not to mention all that came from Puerto Rico and the Caribbean. A special humanitarian moment was when the whole López Rivera family was on stage, Oscar’s youngest brother, José E. López spoke so eloquently about the family’s desire for 35 years to bring him home. He related anecdotes of the trials and tribulations and Oscar’s enduring strength that transcended the prison bars to the family. During this moment that Jose spoke, the thousands in the park quieted down and their silence to hear the love and pain of the family made not only Oscar’s family cry on stage, but also many in the audience. We captured the many tears of the audience that were touched by the your family. It is the subjective factor- “humanitarian connection” moment. We all put ourselves in Oscar’s family shoes and felt the pain, but also the strength. Empathy is so humbling. Clarisa commented that she felt overwhelmed and happy to see so many people that traveled across US from different state lines to support her father’s release. If all that attended got on board to work the campaign in the next 105 days (the number of days Obama has left in office), we can become a force to be reckoned and secure Oscar’s release. We called it a “mission accomplished” in the crunch time of only 5 weeks. Imagine if we had a year to plan it. We were decolonized in this process especially when we felt the unity that Oscar promotes and freedom clamor he represents.